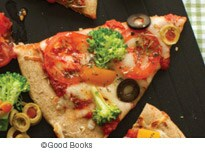 This healthy pizza recipe is easy for young cooks to prepare with a little help from an adult. Check the crust wrapper for baking temperature and time. Heat the oven. Lay the crust on a baking stone or cookie sheet. Use a spatula to evenly spread the sauce on the crust. Sprinkle with 1/2 teaspoon Italian herb seasoning. Sprinkle the cheese evenly over the sauce. Then add the vegetable toppings. Sprinkle with the remaining herb mix. Bake the pizza according to the wrapper instructions. Remove from the oven and cut into 6 wedges. Serve. This recipe is one of 50 collected in “The Mayo Clinic Kids’ Cookbook,” published by Good Books.